Get real-time information and market insights. Easy and intuitive for beginners, and powerful enough for advanced chartists – TradingView has all charting tools you need to share and view trading ideas. Real-time data and browser-based charts let you do your research from anywhere, since there are no installations or complex setups. Just open TradingView on any modern browser and start charting, learning and sharing trading ideas! CoinTracking is the leader for Cryptocurrency Tracking and Reporting. CoinTracking analyzes your trades and generates real-time reports on profit and loss, the value of your coins, realized and unrealized gains, reports for taxes and much more. With the prices for all existing cryptocurrencies, you’ll always get the complete overview. Whether you just started investing in digital currencies or are already trading like a pro, CoinTracking can track all your transactions in real-time. Use our referral link and receive a 10% discount on all account upgrades. Binance is one of the world’s most popular cryptocurrency exchanges. Binance is popular for its crypto to crypto exchanges services and due to its low trading fees. Binance has managed to gain significant market share due to its impressive number of Initial Coin Offering listings, professional attitude and friendly CEO. Originally based in China Binance recently moved their headquarters to the crypto-friendly Island of Malta in the EU. BitMEX is a P2P trading platform that offers investors access to global financial markets using only Bitcoin. BitMEX founders are finance professionals with over 40 years of combined experience. The biggest advantage of BitMEX is that it provides the ability for any trader to trade using leverage, trading BitMEX’s own XBT (BTC), or a range of other cryptocurrencies. BitMEX platform handles approx. USD$2-3b in transactions daily, making it the world’s largest margin trading platform. Use our referral link and you will receive a 10% fee discount for the first six months. Vaultoro is the world’s first crypto-to-physical-gold exchange. 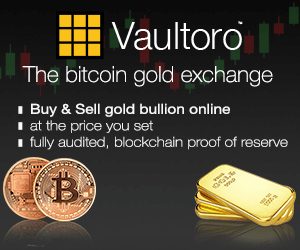 ​Vaultoro allows customers to trade gold with bitcoin directly, all the way down to 0.1 gram in quantity. Customers can hold the asset for seconds or years, with their ownership certificate securely stored on the blockchain. All gold holdings are physically stored by Pro Aurum in Switzerland and audited by BDO. The physical gold can be requested by customers or left in the vault, where it is also insured. Vaultoro​ has announced that it is now the first bitcoin exchange with an implementation of the Lightning Network as an instant deposit method. Vaultoro is also working on a gold-backed debit card.